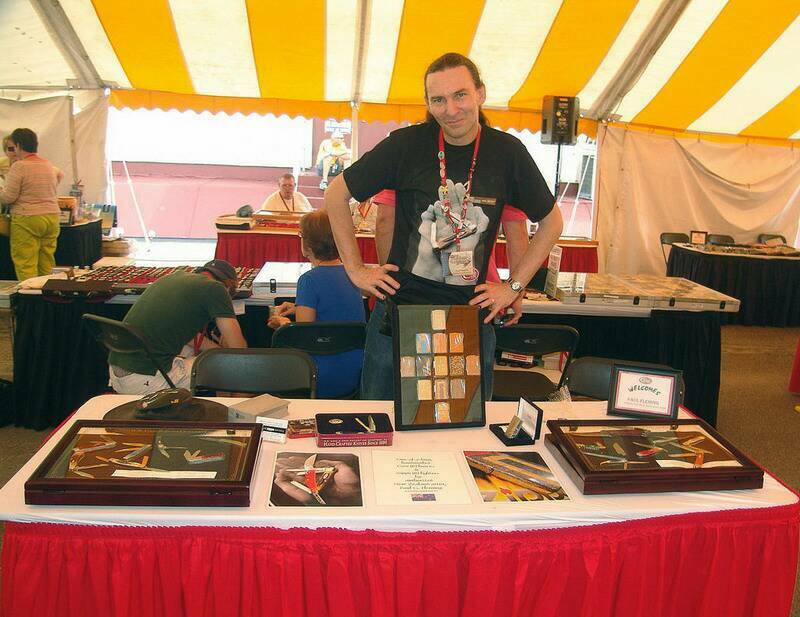 "In all things be passionate"
This resulted in exhibiting work at the 2004 Zippo/Case Swapmeet , 2006 Zippo/Case Swapmeet , 2007 Zippo 75th anniversary meeting & 2008 Case Collector Appreciation Weekend held in July in Bradford, PA, USA - the home of Zippo & Case - & the 2009 Zippo Flamme Deutschland 5th Internatonal Swapmeet in Germany. 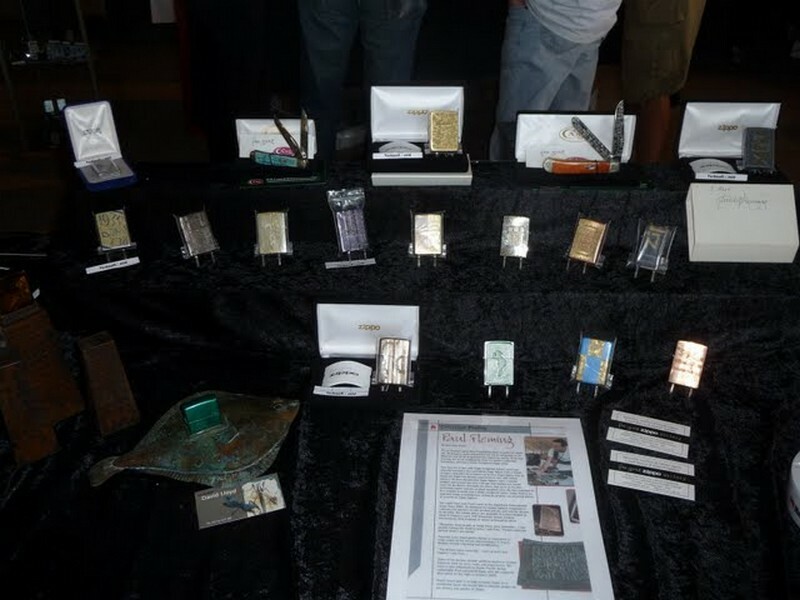 Many pieces found new homes with Zippo staff & passionate collectors. I have also been honoured with the special friendship of the Roseart team (also of Bradford), producers of the exotic Roseart table lighters & have created a handful of pieces for them. About 1992 a good friend, Rudy Galloway, gave me my first Zippo - a 1991 Operation Deep Freeze Slim Ultralite Zippo - on his return from working in Antarctica. 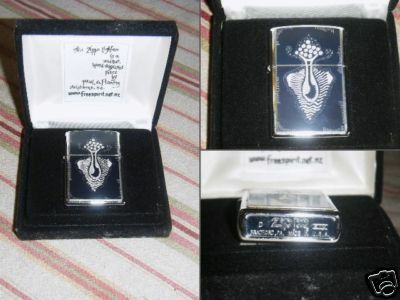 It was lovingly used & later became the first Zippo that I hand worked with a double-sided artpiece of mine (by replacing the Ultralight chips with anodized aluminium engraved plates) - I had decided that I wasn't happy having a Zippo that there was more than one of & so it became the start of a love affair of producing only one-of-a-kind designs on Zippos. After much more use & admiration from other Zippo lovers it's now retired & takes pride of place in my personal collection. 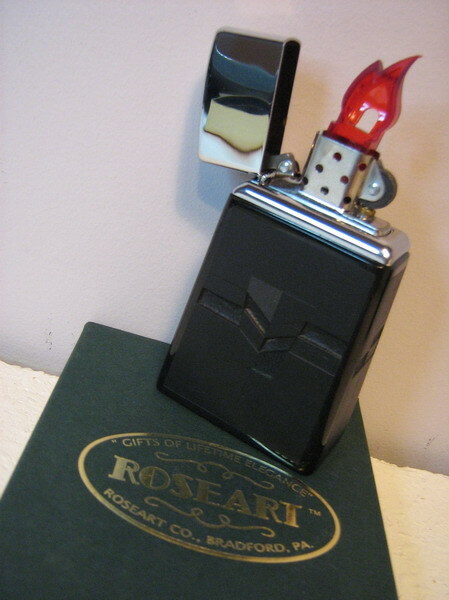 Since then my everyday lighter has been a 1996 Original 1932 Replica, 2nd Release (love that shape!) with another design & my motto "In all things be passionate" in miniscule letters. Pieces are only available direct through this website (here) or our shop & have only rarely appeared on the secondary market (perhaps 5 in the last 7 years to my knowledge). 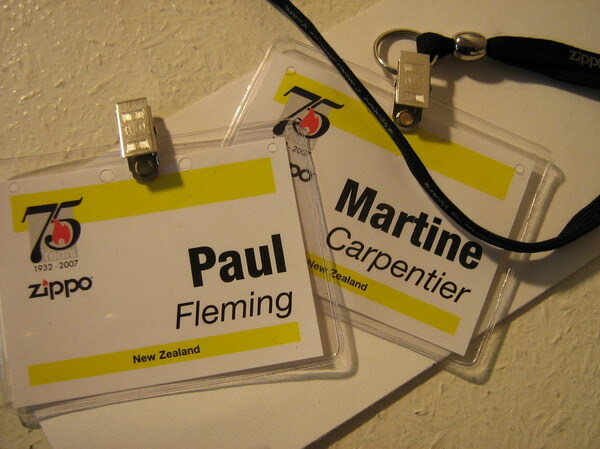 Unlike some artists who have a team of people under them, & sign off the work as theirs, each design is worked entirely by myself, meaning yearly output numbers are low (eg 2009 saw 69 pieces). 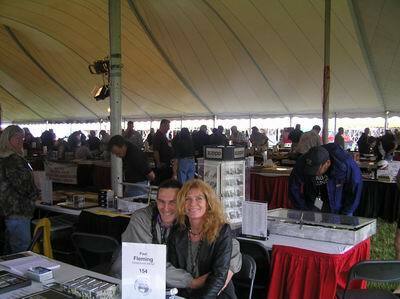 There is a 12 - 18 month waiting list on custom designs done to order. 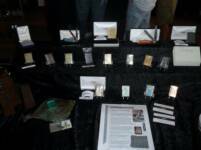 Pricing is based upon time involved & the cost of the base Zippo - a single piece can take between 3 & 35 hours depending on the complexity & coverage of the design. I also produce a simple, cheap "Kiwiana" range for a tourist shop here in New Zealand - again all one-of-a-kind, & normally with a fun sheep or 2 & a few gently humourous words about New Zealand. As a stylish, functional lighter with a lifetime guarantee Zippos are unparalleled - the perfect canvas for a miniature one-of-a-kind artpiece. 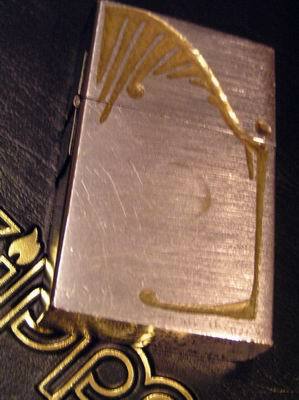 The designs are worked into the Zippo using hand held rotary engraving (1st pic.) 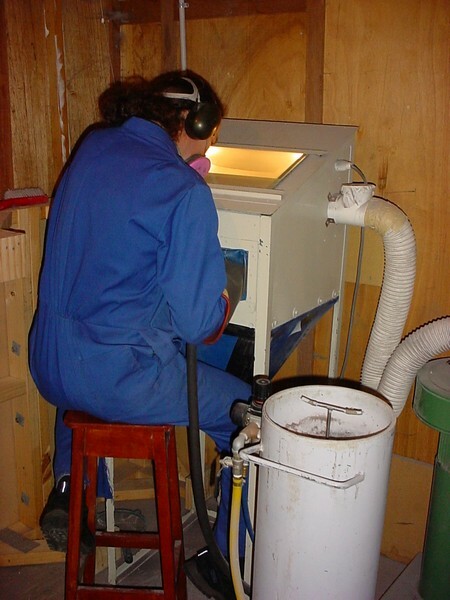 & decorative sandblasting (2nd pic.) techniques. 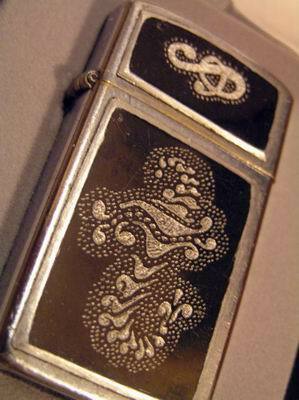 By using different depths of blast and/or engraving a great variety of colouration & effects can be obtained which is very difficult to clearly photograph - many of the designs can only be fully seen by moving the Zippo around causing the light to highlight different parts. Over time & with use the colouration will darken a little. 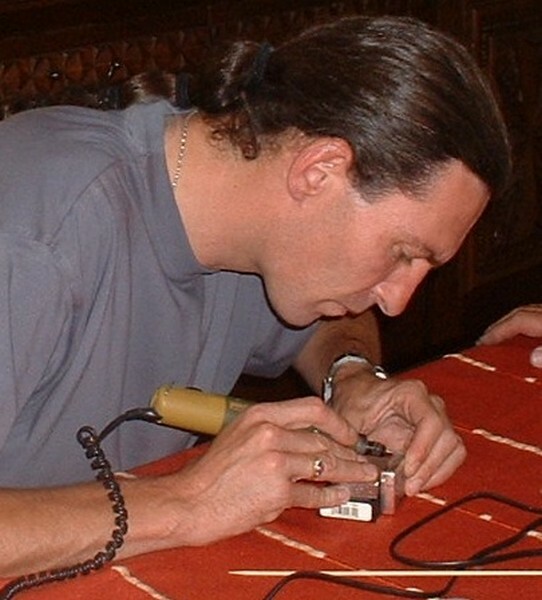 Each piece is signed P.G.F. - early ones usually PGF in the bottom right corner of the front face (the pic. is of a very early piece), & later ones with it & the year it was done to the right of the Zippo logo on the bottom stamp. 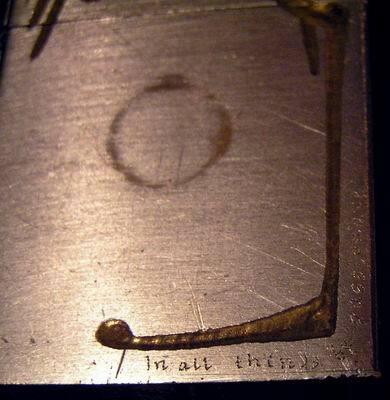 Pieces worked since 2005 have a tiny "No 1 of 1" on the bottom of the face opposite the hinge (although some have it in other areas depending on the design.) Since the start of 2009 each piece has been specially coded & detailed records kept. Sadly, as a result of a few computer crashes (aaaaaargh, hate that!) my personal records of most of my earliest pieces have been lost although I can instantly recognise them. 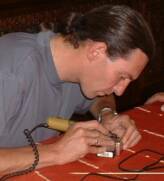 Should you ever have a query if a piece was done by me please don't hesitate to ask as yes there have been some imitations done by other engravers in the wider world. 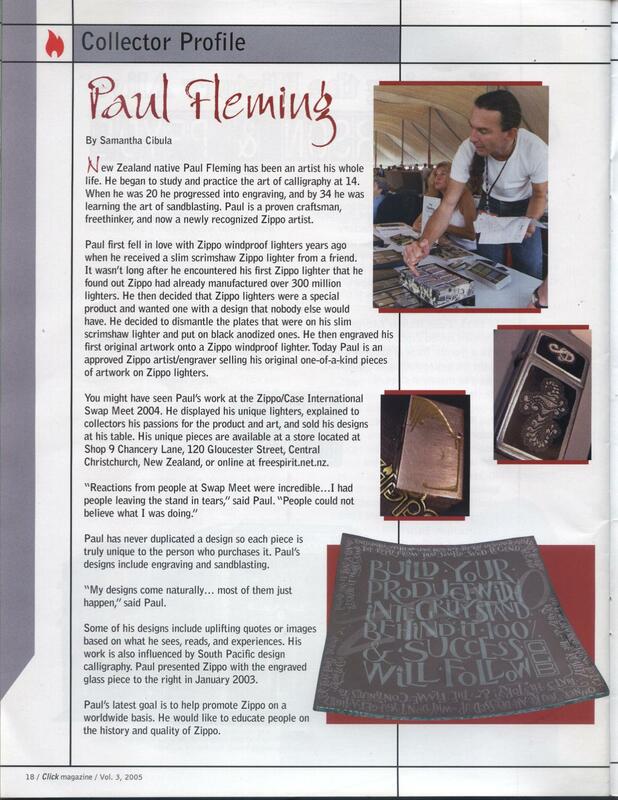 In 2003 I began communicating with Zippo for official acceptance of my work as a "Zippo recognised artist". Whilst anyone can purchase a Zippo & do whatever they want upon it, from a legal standpoint it cannot be then sold as a Zippo without Zippo's permission. 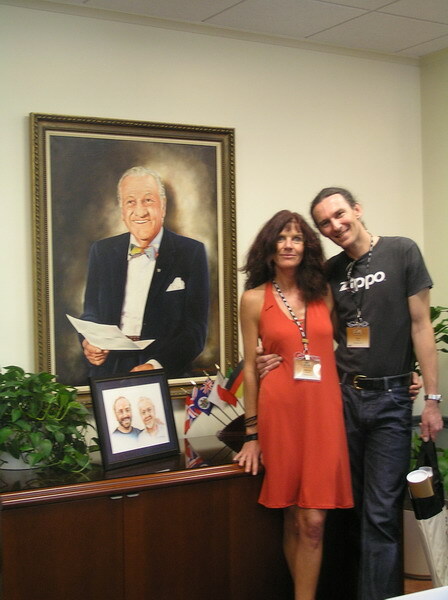 I was honoured with a verbal acceptance by Mr Mike Martin, Zippo's past Vice President of Sales & Marketing, on condition that each piece is strictly a "one-of-a-kind" & that photos of each piece are filed with Zippo. 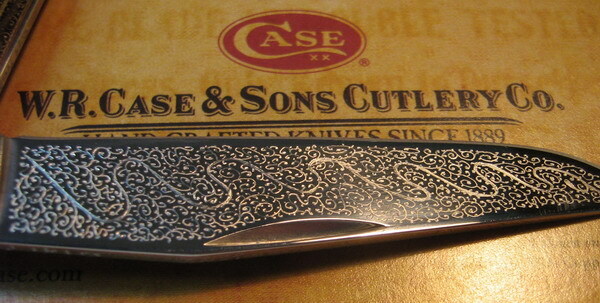 Work on Case knives (a subsidiary of Zippo) started in 2007 with the permission of W. R. Case & Sons' President, Mr Tom Arrowsmith.